A cold front was in the central part of North Dakota as of 7:00 AM this morning. 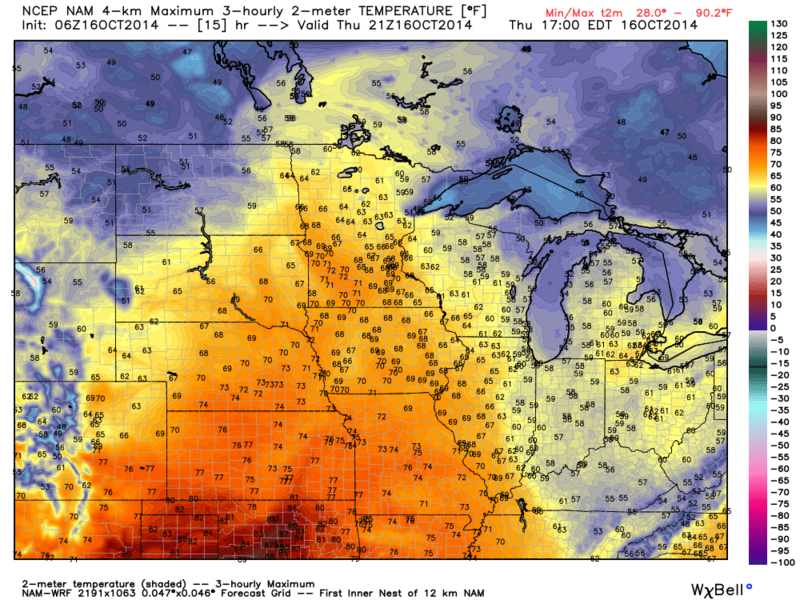 The front will continue to push across the upper Midwest during the course of the day. There is a secondary front along the international border that will have the truly colder air associated with it. Morning temperatures were in the 40s and 50s, a very mild morning for mid October. High temperatures tomorrow may be lower than the temperatures we are waking up to today. With a cold front moving across the state this morning, the wind will or has shifted to the west and after the wind shift expect the wind to increase noticeably. The wind was sustained (average) of 25-30 mph behind the front already this morning and that trend should continue as the front moves east. Later today the wind behind the secondary front will then shift to the north or northwest ushering in much colder air. High temperatures in central and western North Dakota may occur this morning. Afternoon temperatures are expected to be in the 50s in central and western North Dakota but still in the 60s, maybe a 70 in the Red River Valley into western Minnesota. With temperatures already in the 50s in central and western North Dakota, temperatures may climb a bit this morning, but then fall back into the 50s this afternoon, but the temperature rise, if any, will likely be brief. Behind the front, high temperatures on Friday will struggle to even reach 50° with much of the state reaching a maximum in the 45° to 50° range. But the cool air will be short-lived with warmer temperatures beginning to move into the area on Saturday with highs back into the 60s expected as soon as Sunday afternoon. The transition from the mild to cooler temperatures today will trigger off at least some hit and miss showers behind the cold front. Highest probability of recording a shower will be near and north of Highway 2, with any showers south of that line more on the spotty side. 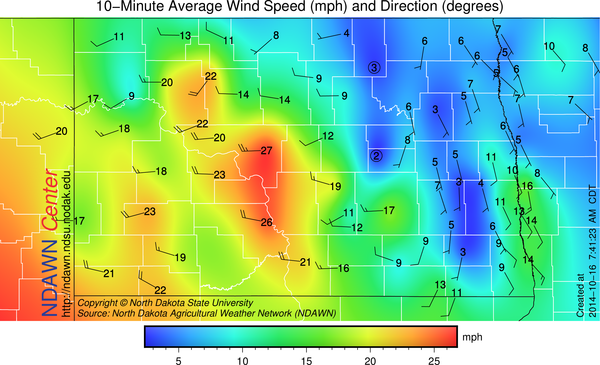 There are already some lighter showers in northwestern North Dakota and that is the activity that is expected to move easterly during the course of day. After a cool Friday, Saturday will be a bit warmer with highs in the 50s, but then 60s are expected Sunday into the Wednesday time frame of next week. So overall the pattern continue to be favorable for above average temperatures with minimal precipitation, but today will be an opportunity for a bit of rain and tomorrow will definitely be the exception on temperature.